Don’t let dirt and grime stick to the exterior of your property. While pressure washing is ideal for dramatic results on concrete, brick, and other hard surfaces with tough, aged stains, soft washing is perfect for gentle cleaning that avoids potential damage to exteriors. Freshen up the look of your building and remove potentially hazardous organic growth with a soft wash treatment. Soft wash is a new cleaning method created to cleanse delicate outdoor surfaces. It’s been popular on the East Coast and in the United Kingdom due to its long-lasting cleaning power. 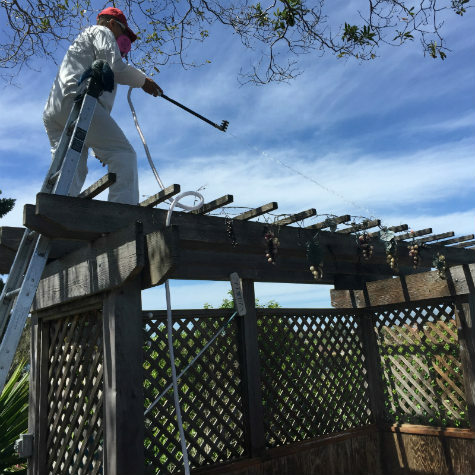 Not all surfaces can survive a powerful pressure wash, including shingle roofs and ornamental trellis. Soft washing doesn’t depend on force to lift dirt. Instead, it uses a controlled application of water mixed with cleaning solution to create a deep clean. Protect the lifetime of exterior paint and other building materials by opting for a soft wash. The cleaning solution used in soft washing targets organic growth like moss, mold, mildew and lichen. It kills the surface buildup of fungi while also killing the root of the organism. Pressure washing removes surface growth, but soft wash goes a step further. Soft wash eliminates the spores embedded inside an exterior surface, preventing regrowth and keeping surfaces cleaner longer. Enjoy your property’s beautiful outdoor living spaces after a soft wash treatment. Dirt and potential allergen-causing growth will be gone. Throw a backyard party or read a book on the patio without worrying over what’s lurking on the building’s exterior. I’ve been using AWC for years and they are always pleasant, thoughtful and arrive on time. Organized, reliable, friendly, fast, easy to schedule, and, of course brilliantly clean windows! Associated Window Cleaning did a fabulous job! Easy to book online, fair prices, super courteous workers…and crystal clear windows! Man what a great experience with these guys. Fantastic job, great care and professionalism. Top notch service as well as availability. This is the place to call for sure. Excellent work. There’s no way you can get your windows that clean in such a short amount of time. I manage a 228 unit apartment 4 story apartment complex in San Bruno. I have been using AWC for window, gutter and duct cleaning for the past several years. Joe and his team were on time and thorough. Very thoughtful as well. I’ve used AWC several times for both window cleaning a gutter cleaning. They are responsive, easy to schedule, thorough, and fairly priced. The crew is very nice and professional and are willing to do what is needed to work with us at our senior living facility. Thanks guys for a job well done once again! Consistently good service and they do a great job! We have been using them for several years. We’ve been working with AWC for years and have always had great service at an honest price. They are a wonderfully run family business. The staff did excellent work, were conscientious, thorough and prompt. I would definitely use AWC again. I have used them repeatedly for the past couple of years. They are very communicative/responsive, they show up when they say they will, and they do a good job. The owners understand the importance of excellent customer service, provide outstanding value, and take care of their employees. I have been using AWC since I moved to Millbrae six years ago. They are wonderful to work with and very professional. They take care of my home and business leaving both sparkling clean each time they come. I recommend AWC for all their services not just windows! Absolute gem to the community. Really nice family owned business. They came when they said they would (a bit early, actually) and did an excellent job quickly and at a fair price. We will definitely use them again. Joe and his crew were professional, efficient and performed their work well. This is the second time I have used AWC and highly recommend them to you. The windows sparkle, my heating ducts are clean and they installed a new filter. I would give more stars if I could!!! The entire team of AWC was just so professional and did an excellent job in cleaning the air ducts in our house. A friend recommended AWC and she has a much bigger two story house & couldn’t say enough great things about AWC. They have been cleaning her windows & gutters & hanging her Xmas lights for years. Great job,and really nice guys, very professional. They did a great job. I look forward to having them back, because I like looking out clean windows! They also did a good job on the chandelier too, it sparkles! AWC did a great job on cleaning our gutters. The crew was lead by the owners son, Joe. I use AWC for my own property and refer them to my family, friends and clients. The gentleman who came to our house today to help us with our vent was very helpful and polite. He really went out of his way. Great service. We picked AWC based upon reviews here. It was a treat to talk to Carol on the phone. Overall, they were friendly, fast, clean and honest. Never thought I’d be so happy to be able to do laundry at home. We discovered our dryer vent was quite clogged (fire hazard!) after getting our dryer repaired. I had my furnace ducts cleaned and windows washed. After the ducts were cleaned my allergies were 100% better. The windows are now sparkling clean and on both jobs, they were friendly and efficent and did a superb job. LOVED this company! I needed the air ducts cleaned after having several months of itchy, dry skin and trying everything else under the sun. I will definitely use them again! After having major sinus surgery, I needed to drastically improve my home’s air quality. We’ve lived in our 60 year old house for over 6 years and have never had our ducts cleaned, I don’t think they’ve ever been cleaned! We had AWC clean our window and gutters. They had crew come by on a cold and blustry day in Millbrae and finished the job in just a couple of hours. Very happy with the service and professionalism. I heard Ron speak at a meeting about how he had a mom who called up his office and wanted to know if they could clean out the air ducts in her house because her two little boys had asthma. If you have allergies or someone in your house does please have this done. Very friendly family owned and operated business, been doing our windows for years. If you are looking for an honest, trustworthy, reliable, friendly crew to do your home or business windows, they are good for the job. We are fully insured with liability and workers comp insurance. A certificate of insurance can be provided upon request.